I have finally finished a piece that I have been working on for several weeks. Some friends of ours are getting married next weekend and I made a piece for them. Usually I would get a couple something from their registry but these two don't want anything. They have been together for a while and have bought or collected most of what a couple starting out would want. Something they do have is a new home. The house is really beautiful and has lots of wall space. Naturally, I thought that I would make them something to hang on them! I really admire the work done at the Zentangle Illuminated Letters master class that was held in Rhode Island. What incredible art was made there. Taking the idea, I decided to try my hand at making one of my own. 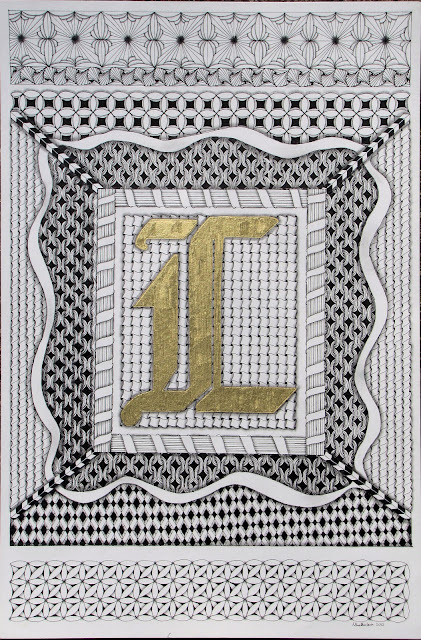 I am not a calligrapher nor is my handwriting very good, so I chose a font that I liked and traced out my letter L. From there I divided the space and kind of made it up as I went along. I am quite pleased with the final product. ﻿I toyed with the idea of adding some light washes of color with watercolor paint but I think I need to learn more and practice before I add to this work. It is hard to see the shading here but the patterns really popped out once the shade was added. This was done on 12"X18" watercolor paper using micron pens, pencil, and the Sakura Pen-touch gold marker. I was going to use my gold leafing pen but it was not working well. I think the pen-touch did a great job. It covered really well and the shine is nice. That's very nice. I bet the couple is going to love it.